A must-have app for those interested in travel. The app provides users with various features from choosing the correct destination to making all the bookings and to easily organizing the trip. The platform basically uses a mash-up technology. The app provides solutions for every possible problem a traveller might face during the course of his or her entire journey. While travelling from one place to another, there are a lot of factors to be considered to make the trip a memorable one. Our platform helps the traveller with anything and everything that he or she might need, from the moment he or she plans the journey till the time he or she is back home happy and content. The platform includes a wide variety of options - from selection of Mode of Transport, to finding out about the destination city, to provision of best music, novels, depending on the mood of the traveller. 1. Creating a spotlight view on home page. What feature(s) did you add? 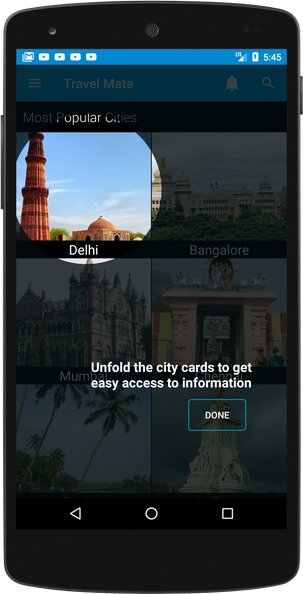 Travel mate app shows list of favourite cities on landing screen. There was task request to create spotlight view on city card for better user experience. How did you implement it/them? To this spotlight view implementation i selected a opensource library i. e Spotlight will actually creates spotlight view on top of our UI. 1. Search view in Currency converter. Travel Mate do have a utility to check different currency rates in utilities section. Where in user is going to select two different currency types from listview, in the existing feature there was no filter option for listviews. So here in this contribution implemented search for both to and from listviews of the currencies. To achieve this i have created filterable implementation to recyclerview adapter. On TextChangedListener used filter override method to filter from existing list update listview. Thanks for the contribution, @hiremani! It's cool to see you contributing to Travel Mate so much. Is this an application you've been contributing to for a long time, do you use it yourself; basically what's the story behind you contributing to it? The spotlight is definitely a nice touch and the ability to search in the currency converter should be pretty useful. Keep up the good work! Thanks Amos for your review and constant support, Yes I have been using this app from couple of days. I personal feel it's nice app because it provides almost everything to an traveller starting from clock and currency converter to hotel booking.....Hmm not only this app I started contributing to other apps as well, Yes I started my journey in utopian with this app and still there are many open new things to be done to deliver nice things to end user so you expect some more on this in future. Thank you for your review, @amosbastian! So far this week you've reviewed 14 contributions. Keep up the good work!